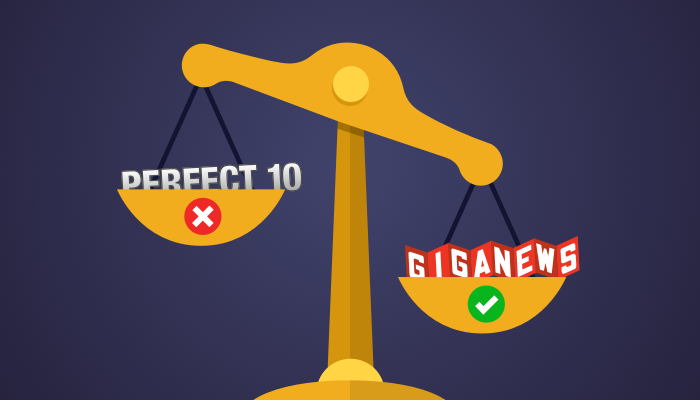 We are excited to announce that the United States District Court for the Central District of California has granted Giganews' motion to appoint a receiver to carry out a levy on all of Perfect 10's intellectual property. The intellectual property includes but is not limited to all domain names, copyrights and trademarks of Perfect 10. The receiver will now begin the process of liquidating the intellectual property. Any proceeds from the sale of the intellectual property will be used to partially satisfy Giganews' $5.6 million attorney's fees judgment against Perfect 10 that was awarded by the same District Court in 2015. This judgment was awarded as part of Giganews' long running litigation with the serial copyright litigant Perfect 10, which originally filed suit against Giganews in April 2011. We won victory after victory over the course of the case, prevailing on every claim and obtaining the attorney's fees award, culminating in a unanimous victory before the United States Court of Appeals for the Ninth Circuit in January 2017. That ruling upheld early rulings of three separate federal judges in favor of Giganews. "We are determined to collect 100% of what is owed to us by Perfect 10 from this cowardly and frivolous lawsuit," said Ron Yokubaitis CEO and Co-Founder of Giganews. "This is a big win for Usenet and for user platforms over the entire open Internet. This ruling will now put a copyright troll out of business and free up the courts from baseless lawsuits." Any parties that are interested in purchasing any of the intellectual property can contact the receiver David Pasternak (djp@paslaw.com), or Giganews' litigation counsel Andrew Bridges (abridges@fenwick.com) with Fenwick & West.